Warning: first world problem complaint. I absolutely hate making my lunch for work every day. The hate isn’t so great that I’m willing to shell out $7 to buy it on a regular basis, but for whatever reason, I dread the five minute chore of getting out my lunch bag and filling it with both my breakfast and lunch for the day. I long for Friday afternoons when I get home from work and can hide away my pink lunch bag until Sunday night. Ridiculous, I know. 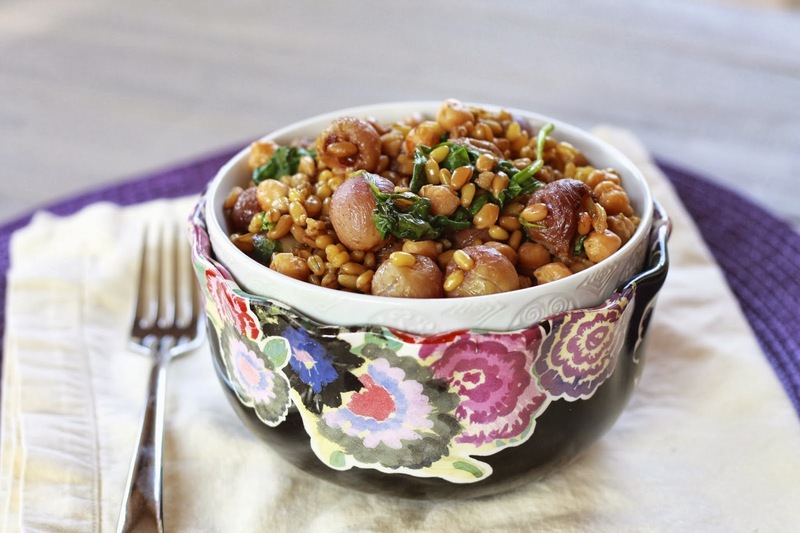 Grain salads like these make packing lunch at least a little bit more enjoyable. Not only does it cut my lunch packing time down by a few…well, seconds…but it’s far more exciting than a lot of the lunches I pack! The nice thing about this salad is that you can use any grain. I had freekeh on hand, but quinoa (not a grain but close enough), wheat berries, brown rice, or anything else similar would work. I usually ate this salad cold, but probably preferred it warm, so you may want to experiment with reheating. The roasted chickpeas were my addition from the original recipe and one I recommend you include, especially if you’re eating for lunch and not as a side dish! Any other lunch packing haters out there?? 1. Cook freekeh or other grain according to package instructions. Set aside. 2. Preheat oven to 400F. Line two rimmed baking sheets with foil. On one, toss the grapes, thyme, 1 tbsp olive oil, and 1/4 tsp each salt and pepper. On the other, toss the chickpeas, 1 tbsp olive oil, cumin, chili powder, cayenne, and a pinch of salt. 3. Roast both baking sheets for 25-35 minutes, until the grapes begin to burst and the chickpeas begin to brown and harden. Scatter the spinach over the grapes and roast for an additional 2 minutes, gently tossing until spinach begins to wilt. 4. 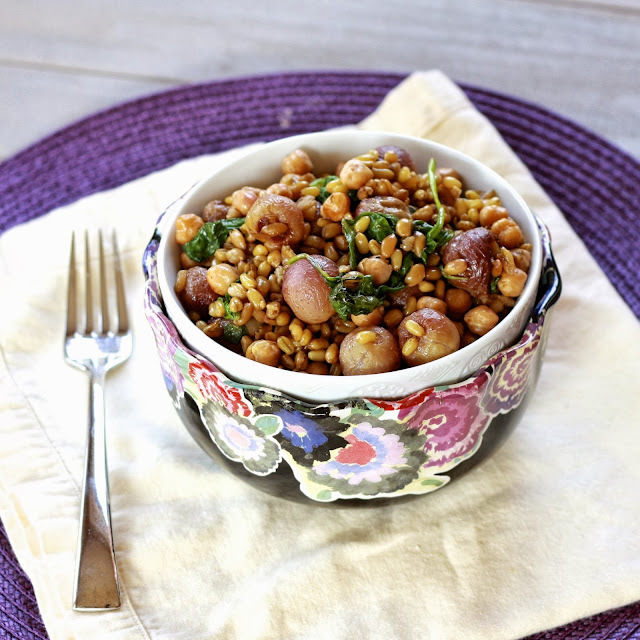 Fold the grapes, spinach, and chickpeas into the cooked freekeh.